Hey folks. 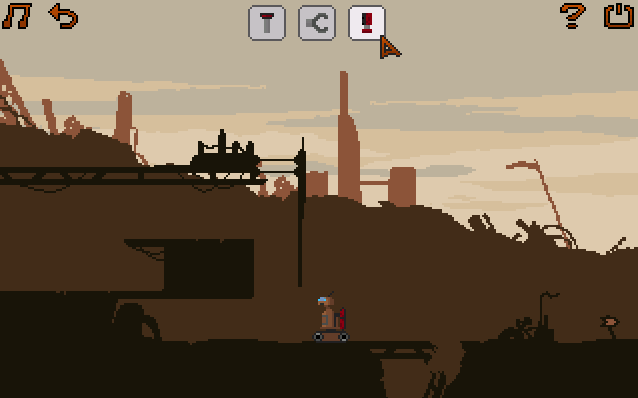 I needed a break from my main project so I spent a month (and a bit) making this little mags-sized game about a solitary robot on an abandoned planet. I guess I would describe it as a point n' click, puzzle platformer. To move Sam click infront or behind him using the mouse cursor. Click on the question mark icon for additional help. Looks interesting - congrats on the release and hope you find you can get back to your main project refreshed and turbo-charged! Thanks. I'm now back to it with gusto! The robot reminds me of B.A.S.S. Looks like just the kind of thing I love! Gonna have a play first chance I get! I'll have to wait until next month to give this a try since I don't want it to in any way influence my current game. Looks interesting. For a strange reason, it didn't occur to me that the arm could cut. I just tried everything on everything else, old adventure gaming trick. Fun fact: I got stuck in the room after that and stopped playing. this is rather a speedrun filled with spoilers, go puzzle yourself and only look it up when you are stuck. What a well-made game! The graphics and story are really sweet. I especially like the puzzles. There are very few controls and all the puzzles are essentially of the "escape the room" sort, but with the combination of the three you were able to really make a fun gaming experience. I give a lot of credit to the creativity of this game. I know it's not that similar but it did remind me of Machinarium. Cheers for the positive feedback Shadow1000. Always reassuring to recieve. The player must make a few logical discoveries to figure out what the 3 possible actions cause in various cases which is an interesting inverse of the usual "use mouth icon on statue to try to talk to it but instead the character licked in on the cheek as he was told to do so in the ancient text he read but which the player has forgotten all about" case. Had a great time with this and really wanted it to be longer! If you devised about 8 more puzzles you would have a very sellable game on your hands! Wow, thanks Mandle. I really wasn't expecting such positive feedback. I don't think about making money from a game. I just love making them for fun (I guess you could say it's a hobby) and if others enjoy playing my creations then that's a fantastic feeling. You've given me something to think about though...maybe I will extend it and add some extra polish to the game in the future.